Its been a while since I’ve written for HTS, but plays like this one make it easy to emerge from semi-retirement. New theatre playhouse, Kailua Onstage Arts (KOA) brings a revival of R. Zamora Linmark’s groundbreaking play, Rolling the R’s, to the stage at The Arts at Marks in downtown Chinatown. The last incarnation that I had seen of this play was at Kumu Kahua Theatre in 2008, so it was great to see it again, like an old friend reunited, electrifying new memories. Directed by Reiko Ho, Rolling the R’s tells the story of Vicente, a young Filipino teenager coming of age in the late 1970s of Honolulu. (see Kalihi). His middle school cohorts include Edgar and Katrina. Edgar and Katrina have already had life experiences way beyond their young, teen years. Vicente is going through his own thralls of new-teen angst and day dreams of his handsome crush— the only haole boy in his school. The cast of nine play a myriad of characters-from students, faculty, neighbors, and lost tourists. Sean-Joseph Choo plays Vicente as smart and thoughtful. He steers the character easily through his daily classroom trepidations and allows Vicente the freedom to explore his daydreams and imagination. Jonathan Reyn’s Edgar explodes like a glitter bomb! Edgar is unapologetically loud and proud. Reyn gives Edgar his fearless fabulousness and no one is safe from his sass or his quick wit on or off the stage. Katrina, played by Maile Kapuaala, is a strong female who, despite her youth, knows her worth. Kapuaala infuses power into her characterization-giving Katrina conviction and a sense of pluck and no-nonsense. Katrina is probably the only person not afraid to confront and stand up to Edgar. There are other performances too worth mentioning; Lisa Ann Katagiri Bright as Mrs Takemoto, the exhausted and beleaguered English teacher who reminds the students about book reports, the importance of ethnicity versus nationality, do not use pidgin english and above all, do not roll the rrrrrrrrrrrrrr’s. Malia Lagaso is triple cast as student Judy, Vicky Stubing and neighborhood filipino yenta, Mrs Cayabyab. Her performances are funny, real and reminiscent of people you may have in your own life. Maila Rondero Kaneaiakala adds Mrs Arayat-neighborhood gossip partner of Mrs Cayabyab. The two do well in this comedic partnership and have many great moments, but probably not as great as when they’re first revealed sporting hair by wig stylist, Friston Ho’okano. Kaneaiakala gives a moving performance as Irma, an abused Filipina housewife trying desperately to find her way back home. The entire cast are solid and genuine storytellers. Yes, there are characters with more lines than others. However, each and every one of those characters/actors hold the production in a vice-like grip. The support for one another is felt in each and every scene, with each and every line. Without expecting it, intermission arrives too soon and you may find yourself, like I did, sitting in your seat slowly processing what you just saw. Staging is minimal and director Ho designed her set using multi-colored square boxes that transition seamlessly by the cast from one scene to the next, allowing the audience to use their imagination and watch the space transform into different locales. Sound design by Barett Hoover puts the audience in the proper time and space. This of course being the disco era of the late 1970s. Disco defined a generation. All the music collected for this production should be gathered on a Spotify list with proceeds going to KOA and The Arts. Yeah, okay this was my generation and the funny thing is, more than two thirds of the cast weren’t even born much less thought of when this music came out. Will they ever know? Probably not... but that’s alright. They have their own music. Light design by Kahana Ho is perfect and purposeful. Costumes by Carlynn Wolfe adds the right tone to a bygone era without being flashy or silly. 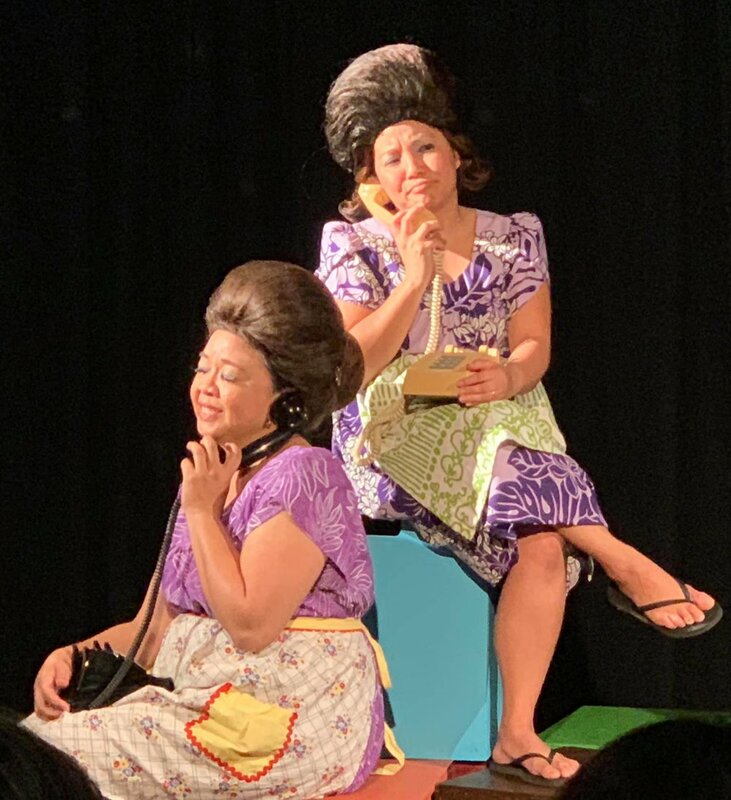 Rolling the R’s plays at The Arts at Marks Garage 1159 Nu’uanu Avenue; Thursday January 3, and Saturday January 5 at 7:30 pm and Sunday January 6 at 3 pm. Then again on Friday January 18 and Saturday January 19 at 7:30 pm and Sunday January 20 at 3:00 pm. For tickets and more information go to http://www.artsatmarks.com/ or https://kailuaonstagearts.com/. Disclaimer: Honolulu is a small theatre community and I’ve known almost everyone in the cast and crew for much of my community theatre life which is over 25 years...(yikes!) So if it this article reads a little biased to you, too bad. Plus you already read this far anyway....No but for real, you should really see this production. Why wait for another ten years?